Not sure if this is a bell, or if I have it upside down. The stones are just awesome though. Prong set marquis shape, prong set pink and white varigated glass stones. 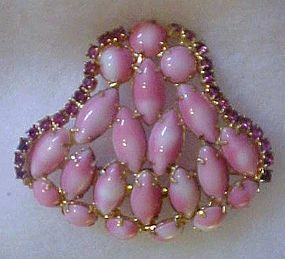 accented by matching cabs and an edging of pink and purple rhinestones which are also prong set. Unsigned but measures a great size of 2 3/8" wide and is 2 1/8" tall. Wonderful condition!